How to find the arc length of a a circle? The following diagram gives the formulas to calculate the arc length of a circle. Scroll down the page for more examples and solutions. Commonly confused with arc measure, arc length is the distance between the endpoints along the circle. Arc measure is a degree measurement, equal to the central angle that forms the intercepted arc. Arc length is a fraction of the circumference of the circle and calculated that way: find the circumference of the circle and multiply by the measure of the arc divided by 360. This video discusses 2 different ways of measuring arc length, by degrees and by distance such as inches. It also shows 3 different example problems, problems you will likely see in class, on how to find arc length using a proportion. 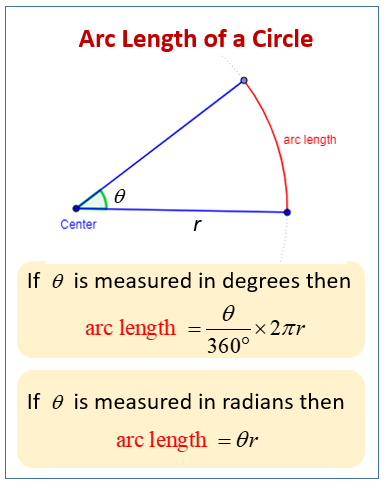 The three different example have you find arc length, central angle, and radius of circles.